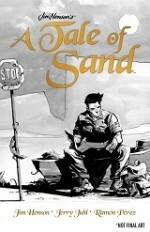 Publisher’s Weekly has interviewed Ramon Perez about illustrating Jim Henson’s A Tale of Sand for Archaia Press. Intrepid reporter Bryan Munn has found more information about the upcoming Vancouver Comic Arts Festival (VanCAF as they want it called) by interviewing organizer Shannon Campbell. Looks like indie comics will have a busy spring, aside from any involvement indie creators might have in the dreaded flea market cons, it looks like they will have some tough choices to make in late April and early May. There’s either a turf war going on or a bunch of blind, inconsiderate decisions being made as per the timing of the bigger indie comics festivals in 2012. …both of those events are the week before the first Canadian indie comics festival of 2012 – TCAF, which is on May 7-8, 2012 (as noted the 7th is also Free Comic Book Day for the rest of the comics community). They recently started taking applications for the curated event so be extra nice to festival director Chris Butcher when you submit your forms. The previously mentioned VanCAF is scheduled for two weeks after that, so it will be a busy month for those who choose to do both TCAF and VCAF… uh, VanCAF! P.S. MOCCA and Stumptown are also on the same weekend as the 2012 CALGARY COMIC & ENTERTAINMENT EXPO… April 27-29.